Limited edition 2011 Capitol ornament featuring Old Abe, who was born 150 years ago. The eagle was named the mascot of the 8th Regiment of the Wisconsin Volunteer Infantry during the Civil War. To date, Zeuske says sales have generated over $50,000 for the Capitol Restoration Fund. She’s hopeful this will be their biggest year ever, attracting the attention of history buffs, those who enjoy the story of Old Abe, collectors, and lovers of the historic Capitol building. The ornament comes just in time for a Wisconsin Veterans Museum event this weekend — Eagles on the Square. This is the eighth year of selling the Capitol ornament. 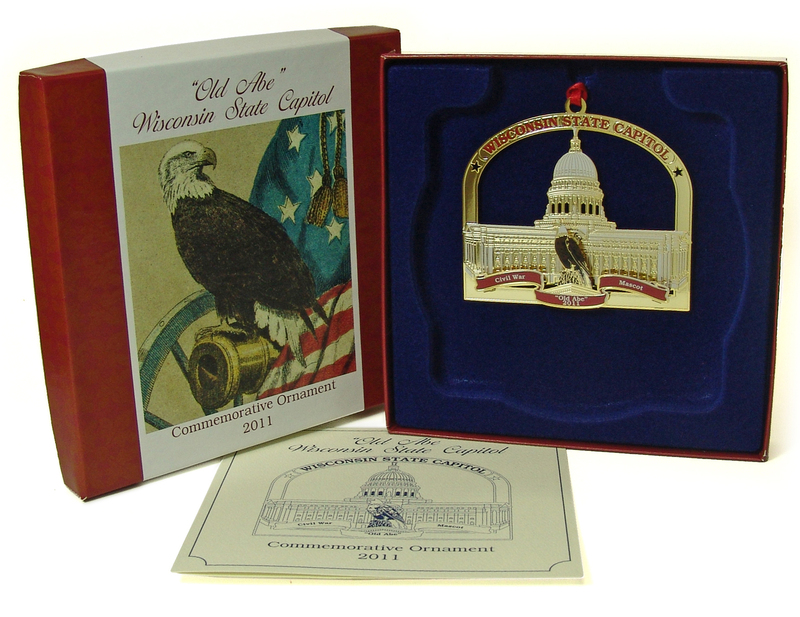 NOTE: The 2011 State Capitol Ornament will sell for $16. It’s available for purchase at the Wisconsin State Historical Society Gift Shop and online store, the Wisconsin State Capitol Information Desk in the rotunda and the Wisconsin State Veterans Museum.